The Metropolitan Police said video footage on YouTube which appears to show an officer hitting a woman during the G20 protests would be examined. 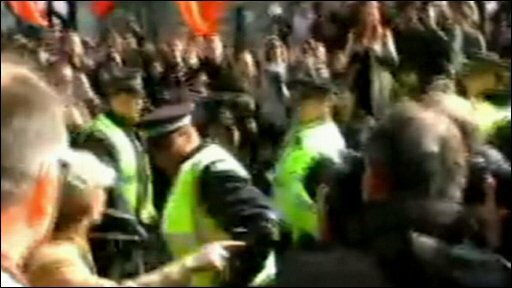 The footage shows the woman swearing at a police officer who then appears to hit her in the face on 1 April. The officer also apparently strikes the woman on the leg with his baton. The Independent Police Complaints Commission said it would look into the new footage of the London protests that has been referred to it by the Met. The latest video comes after the IPCC began an independent inquiry into the death of 47-year-old Ian Tomlinson during the G20 protests. Mr Tomlinson died after suffering a heart attack. 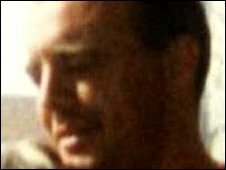 Witness footage apparently showed Mr Tomlinson was pushed over by a police officer shortly before his death. A statement from the Met on the new video said: "The apparent actions of this officer raise immediate concerns. "Once we were notified of this footage by a media agency this afternoon we began to take steps to identify this officer and are currently in the process of referring the incident to the IPCC. "Every officer is accountable under law, and fully aware of the scrutiny that their actions can be held open to. "The decision to use force is made by the individual police officer, and they must account for that." The IPCC said: "The IPCC has been made aware that the Metropolitan Police Service will be referring an incident to us following footage which has come to light this afternoon. "As soon as we get the referral we will look into it and decide the best way to progress an investigation into the actions of the officer involved." It also added that it received "a number of complaints from members of the public about the actions of police officers at the G20 protests". Shami Chakrabarti, director of human rights group Liberty, said: "It is very difficult to understand what justifies a gargantuan police officer assaulting a smaller woman for having the audacity to complain." She added: "It is no doubt a pressure cooker environment, however highly-trained professionals are supposed to be better at diffusing the situation." Labour MP David Winnick called on Home Secretary Jacqui Smith to make a statement on the way "the G20 demonstration was policed" following the footage which he described as "outright police brutality". The Walsall North MP, who sits on the Commons Home Affairs Select Committee, said: "Not only the unfortunate death that occurred, but what I consider to be outright police brutality which in my view can in no way be justified." Footage taken by a New York fund manager which emerged last week showed Mr Tomlinson being apparently pushed to the ground by an officer. Days later more video footage aired on Channel 4 appears to show the newspaper vendor being struck by an officer with a baton. Soon after the police officer seen in the video came forward and was suspended by the Met. The IPCC has also ordered a second post-mortem examination and officers are currently viewing all CCTV images from the City of London and private premises nearby, the watchdog said.